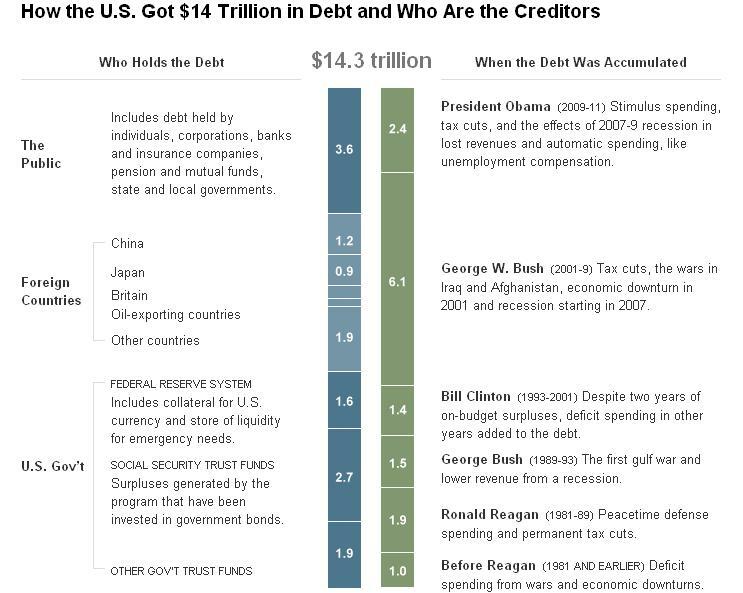 FACTS on our DEBT versus the perniciousness of the Republicans, The Tea Party and those that agree with them! It wasn’t by happenstance we got to 14.3 Trillion Dollars in debt, and no, President Obama did not spend trillions of dollars. The 2.4 Trillions of Dollars that was spent since Obama took Office as you would see from the “factual chart,” it was solely because of George W. Bush and Republicans such as John Boehner, Mitch McConnell, Eric Cantor, Michele Bachmann and many others, that squandered America’s wealth by “overloading America’s Credit Card” from 2001 thru 2008, and beyond. I mentioned beyond because in 2010 when the Bush Tax Cuts were going to expire, President Obama and the Democrats wanted the tax cuts for the 2% of the wealthiest Americans and big business to expire, while leaving the 98% tax cuts for those making 250,000.00 or less, but the Republicans reprobates would have none of that! The pernicious Republicans feasting on their egregious machinations demanded that if the 2% ofAmerica’s wealthiest and big business did not retain their unjustified tax cuts, then they, The Republicans, would allow all of the tax cuts to expire. In simple terms, the Republicans ultimatum was “their rich friends and big business” must keep their tax cuts or elseAmerica’s 98% would lose their tax benefits. In order for the working class not to pay more taxes, President Obama went along with keeping all of the wanton tax cuts byAmerica’s wanton President, George W. Bush, that was extended to December 2012. If the American people don’t wake up and throw these misfits out of Office in 2012, then, it doesn’t matter how much we reduce the deficit, “we would go bankrupt.” It seems self evident that the Tea Party and the Republicans took a litmus test that stated – “We must never raise taxes on our rich friends and big business, but we must balance the Federal Budget on the backs of the working class and the poor!” O! What pangs do mankind creates when they leave the path of righteousness and what is morally right – to chase after avarice for money and power! With the Republicans not being able to agree amongst themselves, it’s no wonder why the Debt Ceiling has turned into a fiasco! Speaker of the house John Boehner’s Bill does not have Republican support to pass in the House of Representatives and even if it does, it is already destined to be defeated in the Senate, so why all of this huts spa? It is self evident that the extreme right wing Republicans and the Tea Party reprobates are playing Russian Roulette withAmericaand the American people, but, on the other hand, it was the American people that voted and installed these misfits into office, hence the reason we are reaping what we sowed! We should always be very careful of what we wish for! George W. Bush and his Republican Party tossed us into deep and unforgiving waters for eight years 2001-2008, and in the space of two years the American people voted and reinstated the Republicans to control the House of Representatives. It is my belief that the American people are decent good people, but they are “big on mouth and short on brain,” and thus the reason why we are headed down the endless drain. Michele Bachmann’s family business known as Bachmann and Associates receives $137,000.00 annually for their so called clinic. This is a clinic that is managed by her husband that teaches – “Pray the gay away!” Just imagine a clinic that is hell bent on trying to convince people that are Gay that they can Pray the Gay away, but yet receives Government subsidies! In addition Michele Bachmann and her husband used the Government Program Freddie Mac and Fannie Mae to obtain a loan for $408,000.00 to move to a larger home, and subsequent to her receiving the loan she has been advocating for the demise of both Freddie Mac and Fannie Mae. Then we have Joe Walsh a freshman Republican that was swept into Office in the November 2010 mid-term elections by the Tea Party. Walsh, 49 often appears on television demanding the country drastically cut its spending and pay its bills. But Joe Walsh’s ex-wife in a recent court filing disclosed that Joe Walsh owes $117,437.00 in overdue CHILD SUPPORT. Imagine a man who doesn’t take care of the children he brought into the world, but yet are advocating to others the necessity to be financially responsible. 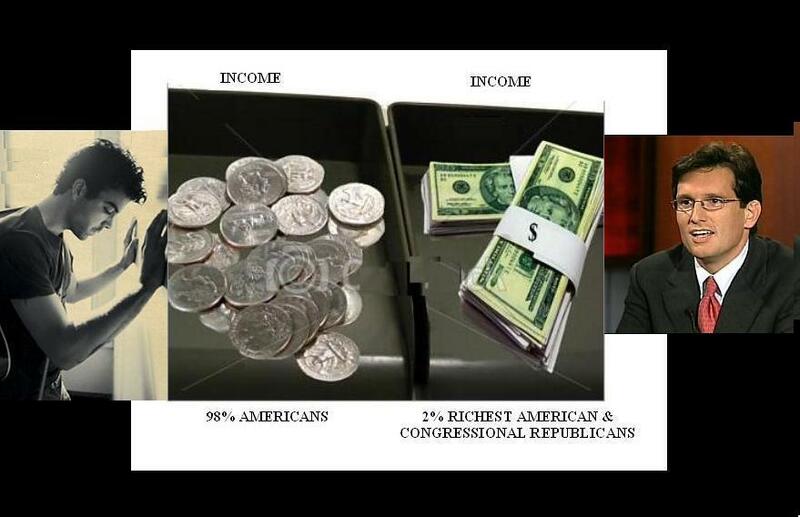 Reprobates: Boehner; McConnell; Cantor; Bachman; and others, are terrorizing the American People; Re: Debt Ceiling! 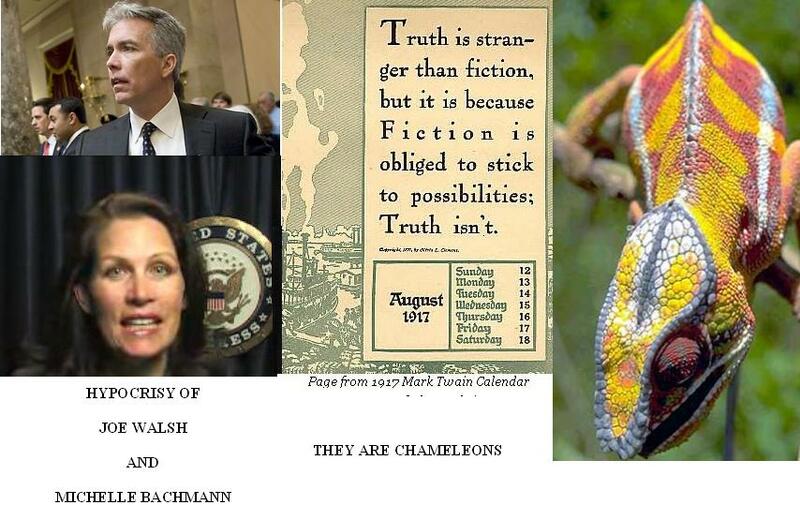 Congressional reprobates: Boehner; McConnell; Cantor; Bachman; and others, are permeating congressional terrorism on the American People; Re: Debt Ceiling! President Obama is going to address the Nation in less than an hour (July 25, 2011 at 9PM EST.) It is my belief that he is going to tell the American People that he “is going to invoke Section 4, of the 14th Amendment to the Constitution and raise the Debt Ceiling to ProtectAmerica and its people, and the world! Mr. President if that is what you are going to do, you have my unequivocal support, 100% and then some. On April 29, 2011, President Obama released his birth certificate; went toAlabamato console the Victims of the worst string of Tornadoes to hit theUnited States; he gave a speech inFlorida, and returned to the White House that very night. The following night April 30, 2011 he attended the White House Correspondence Dinner with jokes and laughter. I make no apologies for this entire statement, now or in the future. We lifted the Debt Ceiling 89 times under “all-white” Presidents without the unending Circus and Political Theatre as displayed for all of this year. The News Media whose survival is imbedded in creating friction and fiction, they are fully cognizant that “Race,” is the catalyst that is about to drive us over the cliff, but they denounce any thought of “Racism” as it relates to the fiascos since Obama became President! Well, I do in my heart have good will to all people, but I am a realist and have suffered the consequences of people who see themselves as better than the other. For me, I am no better than anyone; I am just different, for all men/women are God’s creation and are the sons and daughters of women, all born independently distinctive as designed by our Creator – Almighty God! 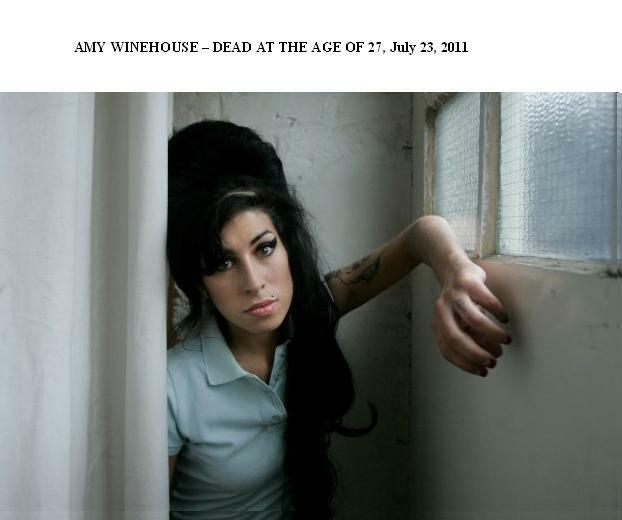 THEY ALL DIED AT THE AGE OF 27! Janis Joplin; Kurt Cobain! All died at the age of 27! Plaintiff prays that the Voters would reject in 2012 all of the Tea Party Lunatics and the 95% of the extreme Right Wing Republicans, thus allowing “sanity” to prevail for the good of the American People! The Republicans position on raising the debt ceiling is not patriotism; it is Congressional Terrorism upon the American people! It is the contention of many legal scholars and former Presidents that President Obama can invoke Section 4 of the 14th Amendment to raise the debt ceiling. On one hand The Republicans and The Tea Party (One and the same) are telling the American people and the world that they are being responsible in their opposition to raise the debt ceiling, unless and until President Obama agrees, to “cut four trillion dollars from domestic spending.” The President has agreed to use means testing to cut waste from our ballooning budget, to prevent throwing the American Children, the Elderly, andAmerica’s most Vulnerable under the bus. In addition, the President is insisting and rightly so, that there has to be some increase in Taxes for the 2% of America’s wealthiest and big business, for which said pernicious tax cuts, is in part responsible for the Federal Imbalanced Budget. The neurotic extremists are absolutely, positively, unequivocally, “hell-bent,” on sacrificing our entire country – “just to protect the wealthiest!” This is by no means Patriotism – this is Congressional Terrorism! HILLARY CLINTON – THE GOOD WIFE! Open the New York Times link and read the story!